Orwell uses dramatic irony to create a particularly subtle satire. Satire stages a critique of an individual, group, or idea by exaggerating faults and revealing hypocrisies. 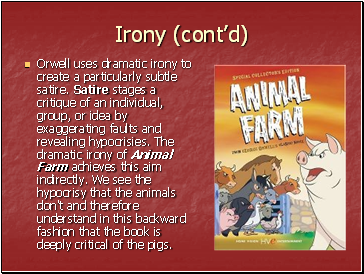 The dramatic irony of Animal Farm achieves this aim indirectly. We see the hypocrisy that the animals don't and therefore understand in this backward fashion that the book is deeply critical of the pigs. 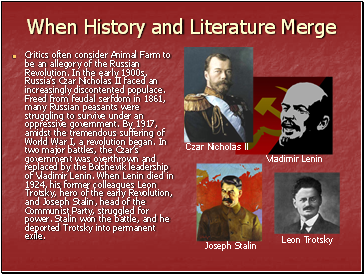 Critics often consider Animal Farm to be an allegory of the Russian Revolution. 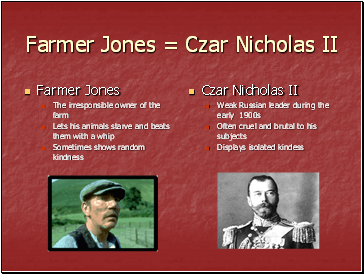 In the early 1900s, Russia’s Czar Nicholas II faced an increasingly discontented populace. Freed from feudal serfdom in 1861, many Russian peasants were struggling to survive under an oppressive government. By 1917, amidst the tremendous suffering of World War I, a revolution began. In two major battles, the Czar’s government was overthrown and replaced by the Bolshevik leadership of Vladimir Lenin. When Lenin died in 1924, his former colleagues Leon Trotsky, hero of the early Revolution, and Joseph Stalin, head of the Communist Party, struggled for power. Stalin won the battle, and he deported Trotsky into permanent exile. Once in power, Stalin began, with despotic urgency and exalted nationalism, to move the Soviet Union into the modern industrial age. 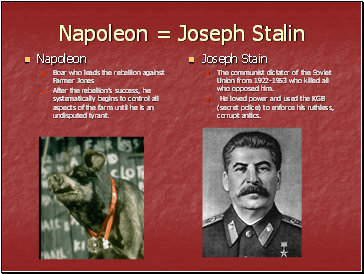 His government seized land in order to create collective farms. Stalin’s Five Year Plan was an attempt to modernize Soviet industry. 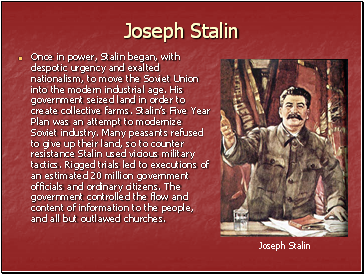 Many peasants refused to give up their land, so to counter resistance Stalin used vicious military tactics. Rigged trials led to executions of an estimated 20 million government officials and ordinary citizens. The government controlled the flow and content of information to the people, and all but outlawed churches. After the rebellion’s success, he systematically begins to control all aspects of the farm until he is an undisputed tyrant. The communist dictator of the Soviet Union from 1922-1953 who killed all who opposed him. He loved power and used the KGB (secret police) to enforce his ruthless, corrupt antics.